Kate Atkinson’s Life After Life is quite the conversation book right now. It’s the one every reader who reads anything is reading (that is sarcasm– I hate those kind of statements that lump all readers together; if there’s any past time that can be more individualistic than reading, I’d be surprised). I started it on Wednesday night and read it every chance I got until yesterday afternoon, when I couldn’t take it anymore. I am not talking about the writing–the writing was poignant, sharp, and sometimes humorous. Kate Atkinson is new name to me, but this is not her first book. Her writing was great. What I couldn’t take was the hardships of the children in the book. The book is about Ursula, a girl who experiences reincarnation over and over again. However, she is not reincarnated into someone else, but always as the same person, in the same life. She starts to understand that her sense of deja vu is stronger than most at an early age, when she gets terrible forebodings about incidents. She can’t explain the feeling of foreboding, but she just knows she has to do something to change what she somehow knows will end badly. She quickly becomes “the odd one” in her family of five children and two loving parents. As life progresses, she becomes more and more confused about what her life is. The book has the feel of a British A Tree Grows in Brooklyn with a magical realism twist. So far, it’s a coming of age story on repeat. And it seems a terrible way to come of age. I want to finish this book, but I am simply incapable of reading books in which bad things happen to children. I’m not alone in this–several of my friends who are moms are in the same reading boat. My Sister’s Keeper put me off books for a week. Sarah’s Key completely did me in; I was nauseated for days… it was like I had a stomach bug, but it was really just a book bug. I simply cannot do books with tragic endings of children. That is why I don’t know if I can keep reading Life After Life. By the time Ursula is 10, she has experienced many different mothers’ worst nightmares. Maybe that wouldn’t be so bad, if the tragic things didn’t also happen to other children who do not share Ursula’s gift/curse of direct reincarnation. Although I think it’s more like a cat with nine lives than reincarnation. Anyway. I’d like to finish, but I’m not sure if it’s worth. 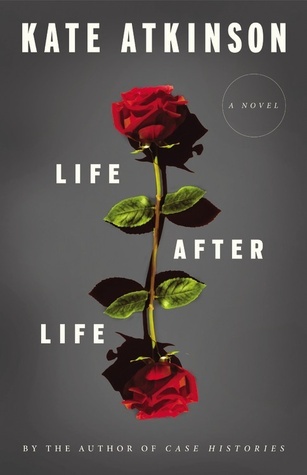 Have you read Life After Life? Can you tell me if the ending justifies the beginning? I have never, ever, ever skipped to the end of a book to make sure the ending was worth the reading…but this time, I’m really tempted to.